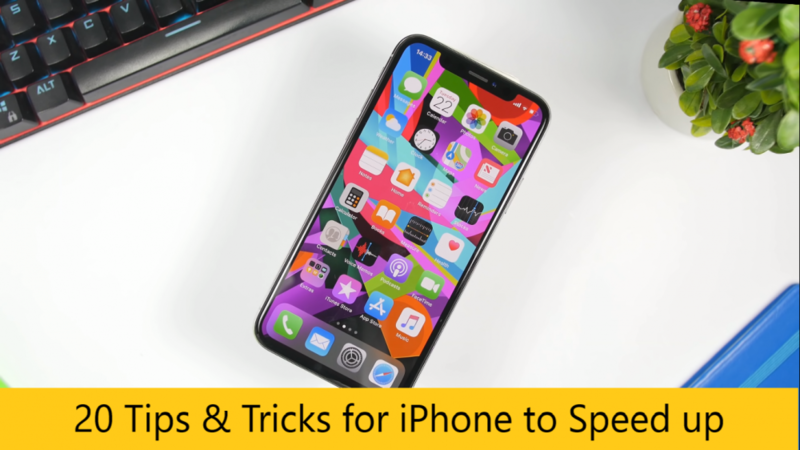 20 Amazing Tips And Tricks – Hello guys, today I will show you guys 20 amazing tips and tricks on how to speed up any iOS device these are amazing tips and tricks that you can perform on iOS 12 devices and most of them even on earlier versions of iOS. so I will try to go as fast as I can through them and show you these 20 amazing tips and tricks on how to speed up your device. How to turn off screen time, if you have it turned on but you don’t need it, you don’t want to use it. make sure you go ahead and turn it off. go to settings then go to screen time and just click to turn off screen time. Reduce transparency iPhone, go to settings then go to general and then accessibility and then go to reduce transparency and make sure you turn it on. Reduce motion, go to settings then go to general and go to accessibility and go to reduce motion and make sure you have this turned on. Make sure you have background app refresh disabled. you can disable it completely or for any selected apps. just go to settings and then go to general then go to background app refresh and make sure you have it turned off. Make sure you turn off location services when you don’t need it. of course, it will slow down your device as it will work in the background. so go to settings and then go to privacy then go to location services and make sure you have it turned off. Turn off iCloud backup, of course, it will slow down your device backing up all the time in the background. what you need to do is just go to settings then go to your iCloud account and then go to iCloud backup and make sure it turned off. Most of us have a ton of apps on our devices and we probably don’t need notifications for most of them. so you will have to turn them off. just go to settings and then go to notifications and you will have a list of the apps right there. just make sure it turns off notifications for any app which you don’t need. Make sure you turn off auto updates from iTunes and the AppStore. just go to settings and then go to iTunes and AppStore and make sure you have all these four turned off. You probably have widgets turned on, which you don’t use or don’t need. make sure you turn them off just slide to the widgets panel click the edit button and you can go ahead and turn off any widget that you don’t need. If you like me and you don’t use Siri or use it very rarely then you can go ahead and turn it off. just go to settings and then go to Siri & search and make sure you have all these buttons turned off. One thing that will improve the speed of your device is having more free space. so having more free space on your device will actually make it run easier and faster. For most of the people the thing that takes up most of their storage on pictures and videos. of course, with iOS 12 you can go ahead and go to settings then go to camera and you can go to format and right there you can choose high efficiency, which will add another format that will make the pictures and videos smaller in size and best that far you can have more space on your iPhone. Always make sure you clean Safari data. go to settings and then go to safari and what you need to do from there is just go ahead and clear history and website data. Of course, another thing that will help is deleting apps that you don’t use. we download a lot of apps on our devices and sometimes just leave them there. if you don’t use an app make sure you delete it from your device. The app switcher is a very important thing on iOS. you will need to know how to use it actually closing all the apps won’t make your device run faster. just make sure you leave there the apps that you use frequently. likely, social media apps, any apps that you use frequently during the day. make sure you leave it on the app switcher. if you open an app that you use very rarely make sure you remove it from the app switch or close it. if you don’t want to open it through the day just go ahead and close it the apps that you use a lot make sure you leave them on the app switcher. Here are a few more simple tricks. make sure you reboot your device every once one in while the device will run smoother. If you rebooted frequently like every two or three days. just make sure you do a reboot of your device. Also every once in a while make sure that you go ahead and clear RAM memory of your device. Another thing you can do is, of course, resetting settings of your device. go to settings then go to general and scroll all the way down and go to reset and from here you can go ahead and reset all the settings. just know that this will reset every setting that you have on your device. Of course, if you’re on a newer iOS version like the iOS 12 and you don’t care about jailbreaking your device or anything like that. make sure you’re always only newest from or possible. so make sure you update your device to the newest firmware. Last but not least is restoring your device. if nothing helps on making your device run faster and if it’s running really slow then you can go ahead do a complete restore of your device from iTunes. So that is it for this article guys. these are my 20 amazing tips and tricks on how to speed up any iPhone. thank you guys for reading and being with us. don’t forget to share this article with your friends, family members, and on the social media and also visit daily on this website for more and I will see you guys on the next one.